This is amazing! I’ve never seen Annie Sloan paint used on a wall. The final product is great. So cute!! Just dying to see the rest of the room tours for your gorg house ? Wow I absolutely love this. If only I could convince my partner….. This is SO cute 🙂 amazing to have wall space to do this! If not in an arts room, I could see this used in a kids room or a laundry room or entry way, somewhere it could really pop but not be overwhelming at all times. Is this paint that you can draw on with chalk after it dries? So, no, actually. Chalk paint is different than “chalkboard” paint. I asked the same question at first!! Chalk paint has kind of a chalky matte finish, but it’s not meant to be written on with chalk. It’s purely for aesthetics. I feel like it will be! :)) So excited! Thank you so much LRS! I have two tours coming SOON! Man, I can’t wait to buy a house one day so I can paint without having to worry about painting it back to white upon move out! Rental woes!! Oh my God, pretty! I love how the bold accents can still blend in with the whole decor. That wall is gorgeous! It’s an awesome idea! When I saw the first picture I thought it would look great in a kid’s room because it’s fun and not gender specific. But having an office with that wall would be amazing as well, to boost creativity and inspiration. But, but…it’s not in rainbow order. ROY B GIV forever! 🙂 It is very cheery, and will feel nice in the middle of winter. I just love this! A rainbow wall could easily be too much if it wasn’t done right, but this is perfect for a creative space. Such a great idea. Painting is so so daunting to me, but I think this would be worth it. It looks amazing! I would never have thought to do this, and will never be brave enough to, but I’m so impressed! It looks fantastic and not juvenile at all! This is so cute, Els!!! Wow! What a statement. I love it. That’s so bold! 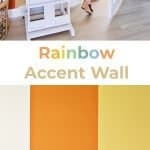 I would never consider doing a rainbow accent wall in my house- especially not by myself! But it looks great- and you’re right, sometimes creativity is inspired by color. I love Annie Sloan chalk paint! It covers furniture and everything else perfectly. 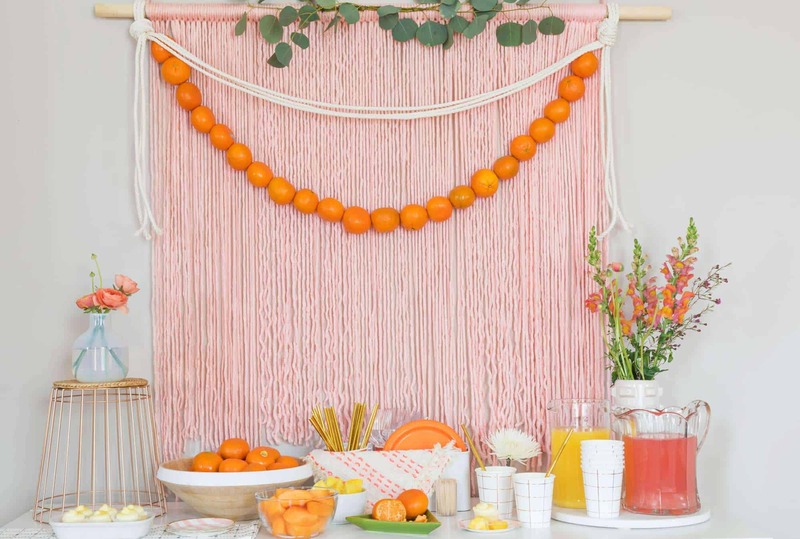 One fun new product you should check out (if you already have done so, sorry, I just found your blog today) that works GREAT with chalk paint or alone on wood, glass, metal, pottery, fabric, canvas, etc. is Unicorn SPiT colored gel stain. Completely non-toxic and an amazing product. Go to UnicornSPiT.com and look up information for days about how this is growing across the nation and globally. Omgosh yes. If I have a kid one day, I want this rainbow wall in his/her room. Love, love love your wall!!!! So cheery!!! I plan on painting a wall in my home, I wonder do you have wax the wall for the final step? The things you do are GORGEOUS! !